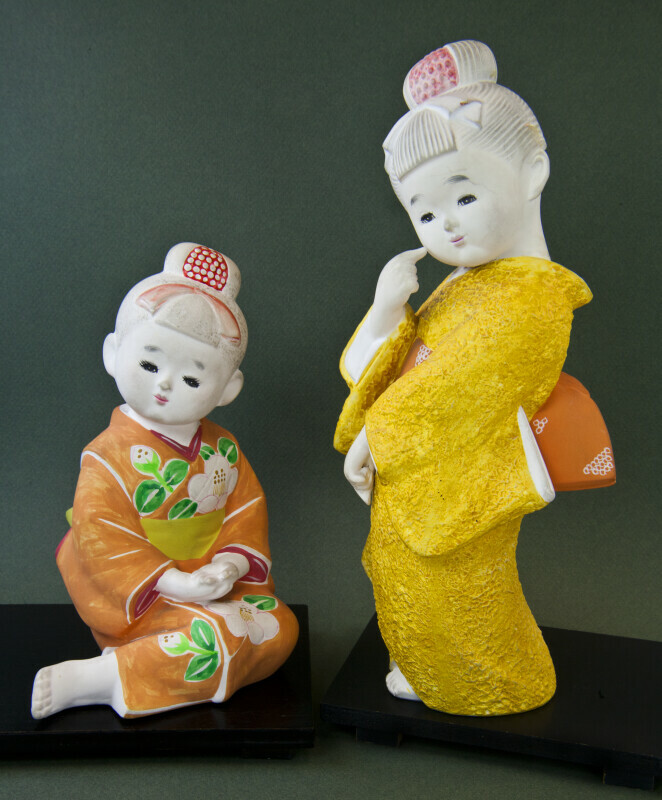 Ceramic statues of Japanese dolls wearing painted kimonos. One of the figures is standing, and she is wearing a yellow kimono with orange sash. The other figure is in a seated position, with a flowered kimono. Both girls are wearing traditional hair ornaments (kanzashi). Kimonos are robe-like dresses traditionally worn in Japan. Kimonos are usually floor length and have collars and long sleeves. They are wrapped around the body and secured with a wide sash (called an obi). The figures stand 7 (18 cm) and 10 (25 cm) inches tall. WARNING: You are about to download a 46.9 MB TIFF!